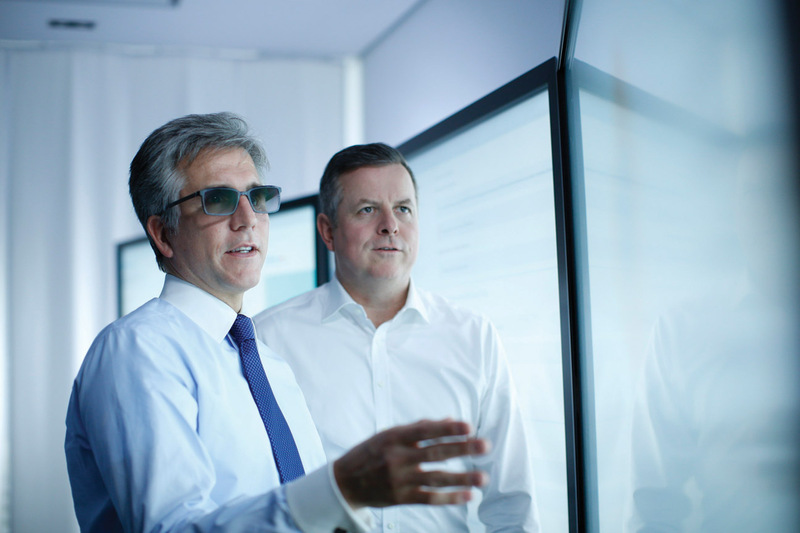 With tenacity, focus, a lot of hard work, and an ability to inspire others to dream big, Bill McDermott rose to the top job at SAP. But, never one to rest on his laurels, he is always on to the next achievement. Could he be a future President? B ill McDermott’s expansive Manhattan office, overlooking the Hudson River, is just a short train ride from the Queens neighborhood where he was born, but it’s a world away. The décor is simple, a desk, a couch, some chairs, a flat screen television tuned to a news channel, sound muted. There is sophistication in simplicity McDermott has said, and his office is all that. The man himself is immaculate. Beautifully groomed and impeccably dressed, McDermott looks like he stepped off the cover of GQ. He’s a youthful 56 years old and he’s all boyish charm. 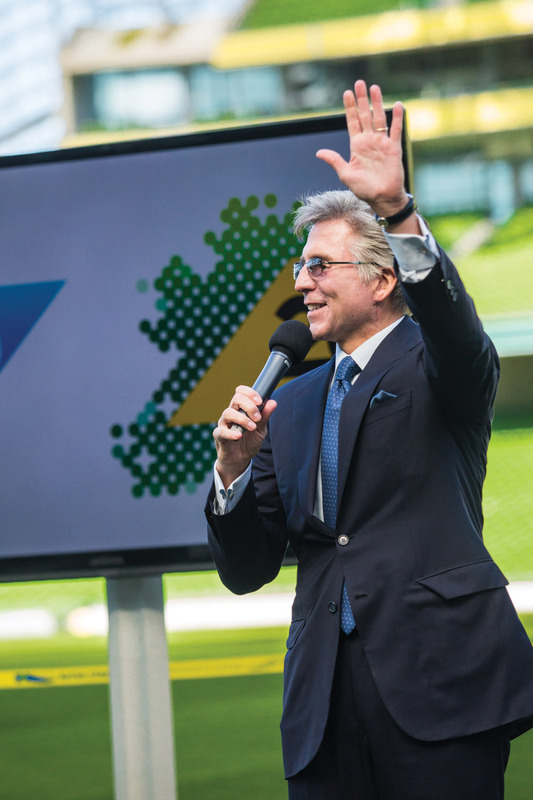 But the most striking thing about the CEO of SAP is his vitality. When he enters a room, the needle flies on the energy amp. He is quick to shake hands with the Irish America team and invites us to sit during his photo shoot, but it’s hard to stay seated watching McDermott in action – his energy is that catching. It’s interesting to watch how McDermott operates. He is 6’2” and trim. He moves with the grace of an athlete and uses his hands a lot. It’s easy to picture him shooting a basketball, or coaching a team from the sidelines as he did when he was still a teenager. “You got this. You’re a pro,” he says to Kit, the photographer, with a trace of that unmistakable Long Island accent that connects McDermott to his working-class roots. A copy of Winners Dream, McDermott’s bestselling book, sits on the coffee table. 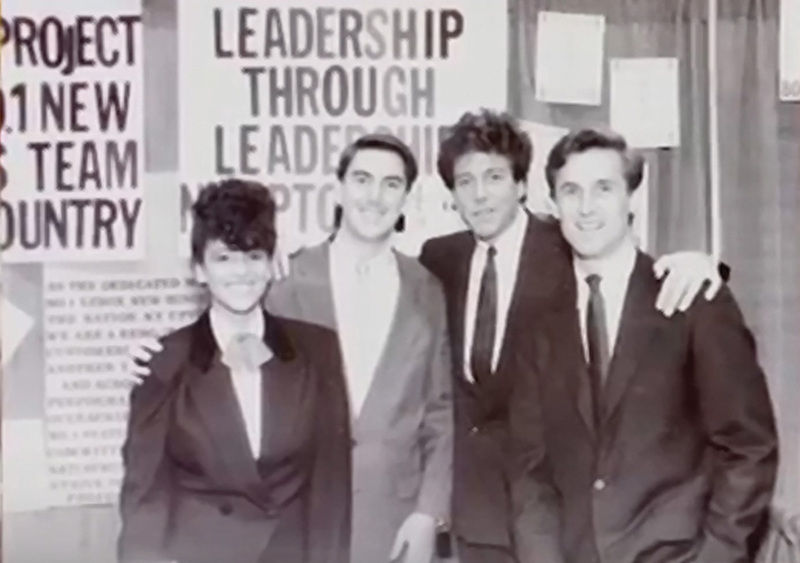 Part memoir, part leadership strategy, it’s an uplifting story of a working-class kid driven by passion and a refusal to quit, who succeeded against the odds, and is now the CEO of the world’s largest business software company. McDermott’s first home was a modest apartment in Flushing, Queens. When he was born, his mother, Kathy, was just 18, and his father, Bill, Sr., was 22. The family didn’t have a whole lot of money, but there was a lot of love and his mother was unflaggingly positive. When his baby brother, Jamie, who was born with congenital defects, died at age five, she assuaged her grief by lifting the spirits of her husband and her young sons. “Jamie is your guardian angel now and he’ll always be there protecting you,” she said. “She had an amazing ability to feel blessed instead of cursed,” says McDermott, who dedicated his book to her. McDermott’s father worked for Con Edison. His young son used to think of him as Spider-Man jumping down into the tunnels “to keep the lights on” when an emergency call came in the middle of the night, and he left for work. Bill, Sr. took every overtime shift that the power company offered. Still, money was always short. Being the oldest, Bill was never shielded from the family’s financial challenges. “I had court side seats to the pressures that come with living paycheck-to-paycheck,” McDermott says. He vowed that his family’s poverty would stop with his generation. His journey to the corner office began at age 11 when he started delivering newspapers in his Amityville, Long Island, neighborhood. He didn’t just toss and go, he got to know his customers and their needs – who wanted the paper behind the screen door, who wanted it wrapped. Early on, he became “keenly aware of the connection between my money and my customers’ happiness.” It remains the modus operandi to his success. So committed was he, that when he slashed his hand with a packing knife while opening boxes, he returned to work from the emergency room. He had 20 stitches in his hand but figured he owed Mr. Kelly 90 more minutes on the clock. When Bill was 16, he worked in a deli. Within a year he bought the business for $7,000 on a promissory note due in a year. He sealed the deal by telling his lenders, “If I don’t make the payment, you own all the stock.” He talked his suppliers into giving him credit and he attracted young customers with video games, making a deal with the distributor for a 50/50 profit split. Under the 17-year-old’s management, the deli thrived. McDermott paid attention to his customers, remembering their personal stories, asking about their families, delivering to older people, and extending credit to those he knew were living paycheck-to-paycheck. He was still in high school, so his mother, father, brother Kevin, and sister Gennifer, as well as good friends, helped out. And when he enrolled in Dowling College, he scheduled his classes for mid-week so that he would be back at work for the busiest time. After he graduated, McDermott sold the deli. It was, after all, only a means to an end. He paid off his college debts and bought his parents a vacation home in Myrtle Beach with what was left of the profits. One of McDermott’s deli customers worked for Xerox and told him that the company had the best training program for salesmen. What happened next is brilliantly relayed in Winners Dream, beginning with how, on the day of the interview, Kevin, carried him out of the house because their first floor was flooded and Bill didn’t want to get his suit wet. (Their house, which stood right next to a canal, was often water-logged, despite Kathy McDermott’s devotion to St. Jude, whose statue she would put in the front yard in the hope that he would hold back the flood). A top salesman by age 21, McDermott was, by 24, managing one of the company’s highest-performing sales teams and soon moved into more senior positions. Another great thing that happened to him at Xerox – it was there he met his future wife, Julie. Today they have two sons, Michael and John. Had he stayed at Xerox, there is no doubt that he would have become CEO. But after 17 years, he left the company. The world outside was changing, and he felt top management wasn’t changing quickly enough to match the digital age. He moved on to senior executive roles with Siebel Systems and Gartner before joining SAP in 2002. He quickly turned the flagging business in North America around and took on responsibility for Asia and South America. In 2010, McDermott was named co-CEO, and four years later he was sole CEO, the first American in the role. That same year, he unveiled a digital age strategy to help businesses of all sizes “Run Simple,” which was met with huge success. Today, with the SAP HANA Cloud platform, business applications, and business networks, SAP serves nearly 335,000 customers in 190 countries. 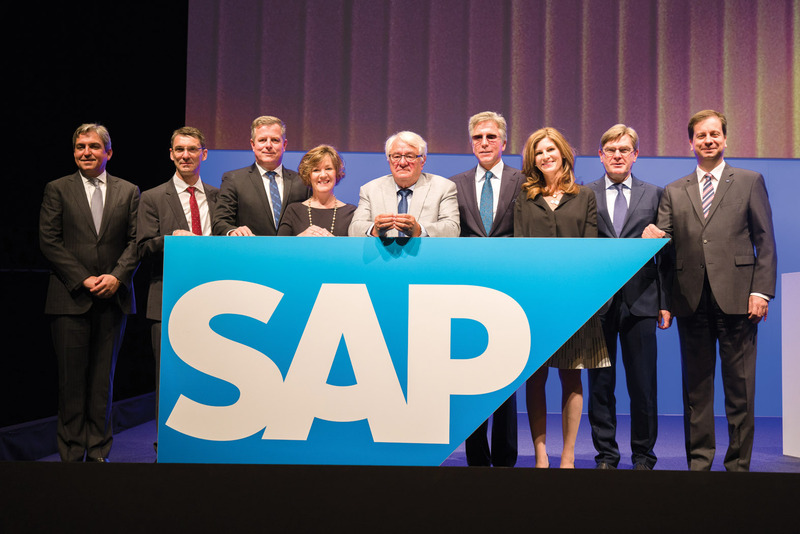 McDermott now oversees 87,000 SAP employees and never expects more from them than he expects from himself – he leads by example, and inspires others to do the same. He wants to make the world run better and improve peoples’ lives, and has ensured that SAP is a company that values giving back. Employees are encouraged to give a month of service each year to charitable organizations. And SAP technology has saved lives in natural disasters and is helping researchers conquer diseases such as cancer. It’s the kind of forbearance that Bill exhibited in 2015 when he fell down a flight of stairs at his brother’s house and was badly injured. He managed to crawl to the street to get help, though he couldn’t see through the blood on his face. A shard of glass had pierced his left eye. Despite 12 operations, the eye could not be saved. McDermott pushed himself to get well. “I tell people now, the world will never remember how you fell. But they will never forget how you got back up and kept moving forward,” he said. Just two months after his accident, a competitor, taking advantage of the crisis, tried to poach on SAP’s turf. In an extraordinary meeting, Bill coached his team from the sidelines and took them to victory. My takeaway from McDermott is that he is a player/coach. He knows how to build a team and lead them to victory. It’s something that’s in his DNA. You’ve said that basketball and your parents were the biggest influences in your life. Let’s start with basketball. In my family, everything was focused on playing hoops, competing, being the best you can. And we love to win. I inherited from my grandfather – who was a Hall of Fame basketball player who gave it to my father, who gave it to me – this passion to perform at your best and there are no excuses. It’s show time, and when it’s show time, you show up. She really was amazing. She would say, “Bill, the best part of you is you.” She was always encouraging, telling me there was no ceiling on what I could achieve. We’d move from this apartment to that house, to this foreclosure, to this flood and that fire, and through it all she stood so tall with such resolve. Not just resolve, humanity and happiness and joy. She was always there for the underdog. You could say, “As a working class kid in Long Island, weren’t you the underdog?” But there are always people whose circumstances are more challenging than yours. And my mother could find them all. She had such a great heart. You need a lot of self-confidence to be a good salesman. Where does yours come from? I was a relatively shy kid, but not so shy that I couldn’t deliver newspapers. I derived tremendous self-confidence from work. I learned that if I am actually in service to you, giving you what you want, you will give me a good tip. It’s the old-school, “I can get anything in this world I want if I help enough other people get what they want.” That became a kind of a force-multiplier in my teens when I came into my own. I give the credit to my mom and dad, definitely my grandfathers – not just my grandfather the basketball player, but also my grandfather the construction engineer. His workshop was organized, everything was precise. His shoes were immaculate, even when he went on a construction site. My dad was a very hard worker. He would get up at 11 o’clock at night to chisel the ice off the car to make it in time for his midnight shift. He would often work two or three shifts to get the overtime. He was a very dedicated dad. You are also big on giving back, and making it part of the culture of your company. Why? I believe we have a higher purpose to our vision. Not just because it is the right thing to do but because it’s the smart thing to do. This is a generation that is inspired by purpose, and our purpose is to help the world run better. We look at ways our software can improve peoples’ lives. It could be giving university students access to our software so they can be trained for a better paying job when they come out of school. It could be making the world run better by initiating the uninitiated with a mobile business application. One of my fun stories is from when I became co-CEO in 2014. I gave a speech in Germany at the CeBIT conference, which is the biggest technology conference there is. It was a packed house and here I was, the American who doesn’t speak German, taking center stage with Chancellor Merkel and other dignitaries. So I brought up a woman named Christina Marole from South Africa because I wanted her to be the story. She has a spaza, a little convenience store, and she used to spent 80 percent of her profits on transportation costs going to get stock on the shelves and replenish inventory. She was losing most of her profits just on that exercise. But the worst part was, her son had to watch the store while she was traveling. With one mobile application, she is now able to augment her supply chain and do things digitally so that suppliers now bring the stuff to her. Not only did her profits go up by 80 percent, but her son was able to finish his education. So the moral of the story is, we are improving people’s lives. And the audience got it and Chancellor Merkel was inspired when she came to the stage. It was a great moment. Any advice to young people starting out? You can’t go wrong when you’re being human. You can only go wrong where you are trying to be something you are not or you are working with material that you don’t believe in. Pretty simple. Do you think robots will replace humans? The reason why humans still matter and will always matter is because robots and artificial intelligence can’t replace the instinct to do what’s right. To have the judgment in the crucible of the moment where a call has to be made, you have to rely on all of your instincts and all of your skills and all the trust that you built around you to make the right decision. You have to have the judgment to do the right thing. Thank god, of all the things that I am, I feel I am blessed with the emotional intelligence to calm it down when the field is moving real fast and sort it out and make the call. And when you make the call, have a lot of confidence in it. Because a lack of decisiveness only leaves people hovering for a decision and getting frustrated because one isn’t being made. And making a decision based upon outcomes that aren’t tied to the purpose of the company is something that doesn’t work. So, having the purpose, having the emotional intelligence and the team around you to make the judgment call with great confidence and trust, and the belief that you are doing the right thing, is a gift. You are known for making pageantry and celebration of achievement an important part of your management style. Why? You don’t play basketball at a high level to get paid. You play to win. You play to be a champion. You don’t go door-to-door in the grueling cold of New York for a paycheck. You do it to be the number one salesman in the world. You don’t trade off a high paying job to manage people to become a leader for the money, you do it because now you think you have a skill that can be transferred, or you can create a collaborative network with these other women and men to make them better than you and that together you can be the best team in the world. Over time, the celebrations really did make a difference. It’s always taking the thing that inspires the human dignity and the human dream to a level of pageantry. Where, for just a moment, you can be the greatest in the world. And that really does matter. Somehow, I don’t think people spend enough time thinking about what it means – even if is just for a moment – to a person to be the greatest in the world at what they do. Ryan says: “Bill McDermott is the most inspirational leader I have ever met. It is a pleasure to be in his company. His primary focus is always on serving the customer and treating everyone he meets with respect and empathy. This is important here as it relates to real people – customers, employees, and those whose lives we are striving to improve. Bill shares so many examples of how innovation is driving change for the better in areas such as healthcare, disaster relief, and environmental impact. Bill’s unerring focus is on leading SAP to help the world run better and improve people’s lives. 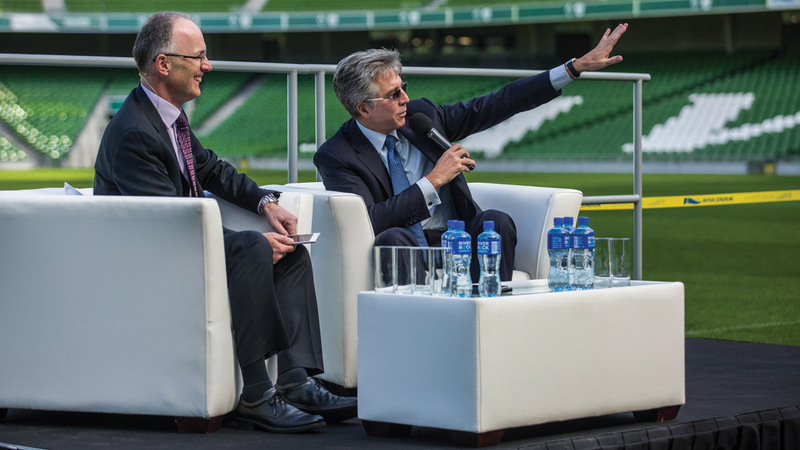 “SAP Labs Ireland celebrated 20 years in Ireland this year. We employ over 2,100 people in Research & Development, Services & Support, and Commercial Support. Colleagues for the SAP Labs here have been to all corners of Africa delivering “train-the-trainer” sessions in coding as part of Africa Code Week, an initiative that this year will have reached 1.3 million children, introducing them to the language of coding. At a local level, our Community Involvement Forum drives fundraising, volunteering projects, and the SAP Foundation helping charities and schools. This year, our Autism@SAP program will celebrate five years in partnership with Specialisterne Ireland, enabling over 100 young people with autism to start roles in Irish industry. What’s the best thing about being in the top job? You can get anything in this life you want if you help enough other people get what they want. The best part of being a leader is that people look to you for the permission to dream and for a clear path to help them to achieve it. How important is it to you to remember where you came from? My mom always told me, “Be you – the best part of you is you.” Always remember: how it was in the beginning, it shall be in the end. I’ve learned that the privilege of a lifetime is being yourself. That’s why your winner’s dream is your journey as you strive to be true to who you really are and create a life of authenticity. What are some of your leadership maxims? Trust is the ultimate human currency. Know what you want, then want it more, and then want it more again. What you focus on in life expands. Vision is not only what you can see. It’s how you feel and how you make other people feel. It’s about creating a cause, a movement. Empathy – it’s about coaching people to see the world one engagement at a time through the eyes of the other person. Putting your agenda to the side and reading the room. How important is the culture of your company – i.e., what sort of behaviors do you cultivate at SAP? Culture is the difference between a group of people and a team. Together, everyone does achieve more. A great culture challenges people to build bridges rather than silos, to stay curious, and to always keep the promise. We are never done. Intellectual adventure and self-renewal are essential to capturing new frontiers. What are you looking for in an SAP hire? There is no room at SAP for small dreams. We want people who see the world’s biggest challenges as the greatest opportunities. We want underdogs who never take anything for granted. We want people who confront every challenge with their mind, their will, their heart, and their soul. Best career and life advice you ever received? “Leadership is the art of developing followership,” from Barry Rand. Looking back, what was the most crucial decision that you made in terms of your career trajectory? To go for my dream job at Xerox Corporation. If you were to pick one thing that was a game-changer for SAP, what would it be? SAP HANA. Hasso Plattner was the first person in the technology industry to predict that the future of business would be built on real-time data. HANA as the next generation database is the fastest growing product in our history. How do you stay ahead of the game when everything is changing lightening fast in this digital/technology age? Design thinking and innovation. We believe that innovation is a constant process built on an outside-in perspective. We have to constantly challenge ourselves in three areas. Desirability – do we have the big ideas that are going to fundamentally change the world? Feasibility – can we pull this off? If not, what will it take? Viability – do we have the right plan to create value from our ideas. Having reached the top, how do you stay motivated? I focus on making the news, not reporting the news. Complexity is ruining companies really fast. Leaders need to stop “playing office,” get out from behind the desk, and understand what’s really happening in the world. Appreciate every conversation – you never know which one will give you the big idea. If you were to give one piece of advice to young people what would it be? We believe in our responsibility to help young people build great careers. In terms of advice, I’d offer two suggestions. First, passion and planning can overcome age and experience. Second, excuses never built a single stair step to success. You have such high energy. Are you naturally that way? Do you just have great physical stamina? And how do you unwind? I’ve always absorbed energy from the people I have the privilege to meet along the journey. In terms of unwinding, I always enjoy time on the basketball court. What does your Irish heritage mean to you? I am very proud of my Irish heritage. I hold up and honor my ancestors who came before me. They gave everything they had to set up a better life for future generations. Can you talk about the future of SAP? I always tell my colleagues that there is no ceiling on our dreams for SAP. We want nothing less than to be one of the world’s most interesting and admired companies. We want to be a top-10 brand and to exceed every expectation that is set for us. In the end, none of these aspirations matter as much as our ability to live up the vision we set: to help the world run better and improve people’s lives. If we continue to succeed in this endeavor, we will remain a proud, purpose-driven market leader. Can you talk about your accident? Did you really have to dig deep for your mother’s positivity to come through on that one? I remember my mom telling me after a house fire – “There’s nothing inside that house that’s as important as what’s outside of it.” She was a relentless optimist. In my own adversity, I remember thinking that my beautiful family, friends, and colleagues were all counting on me to get up, get out, and get on with it. My indomitable will to rise overruled my rational mind. As I tell people now, the world will never remember how you fell. It will never forget the manner in which you came back and kept moving forward. Lastly, rumors abound that you will run for political office when your term is up at SAP. Is that a possibility? I am the CEO of SAP. This is the job I want and the one in which I believe I can make a meaningful difference. I’m more than satisfied to live this journey one fulfilling day at a time. Thank you, Bill McDermott. Beir Bua. Click here to view the complete 2017 list. Gerry Adams, president of Sinn Féin and one of the most formidable figures in Irish nationalist politics for nearly 50 years, announced at the Sinn Féin party conference in November that he plans to retire in 2018, ceding control of the party he has led for 34 years, and making way for a new generation of Irish republicans to come to the fore. LinkedIn officially opened its new Europe, Middle East, and Africa headquarters in Dublin in September, revealing a new $100 million premises on the Grand Canal Dock. The headquarters was built to meet the needs of LinkedIn’s growing workforce in Ireland, which has ballooned from three employees in 2010 to 1,200 today. It marks the company’s first new construction outside of the United States. “A lot of effort has gone into making [the building] look absolutely fabulous,” Lisa Finnegan, LinkedIn’s human resources director, told Silicon Republic. The new offices feature a soundproof music room, gym with personal trainers, and games room, and are energy efficient, with 250 bicycle parking spots and a rainwater-harvesting system. In October, Minister of Foreign Affairs and Trade Simon Coveney announced the opening of six new Irish diplomatic missions as part of the government’s 2018 budget package. New embassies in Chile, Colombia, Jordan, and New Zealand will assist in promoting trade and investment. A new consulate in Vancouver, British Columbia, will benefit the Irish diaspora in Canada and improve the already-strong Irish-Canadian relations. And in Mumbai, a new consulate will allow Ireland to engage more thoroughly with the western regions of India. “The announcement of these new Irish embassies and consulates are important first steps in expanding our global footprint and diversifying our trade portfolio as we prepare for Brexit,” Coveney said in a statement at Leinster House. For 2018, the government also allocated over $834 million to overseas official development assistance. “We will use these additional resources to continue the fight against poverty and hunger, to build on our work delivering sustainable improvements in living standards for some of the world’s poorest people, and in increasing our response to the unprecedented level of humanitarian needs worldwide,” Minister for International Development and the Diaspora Ciaran Cannon said. Ballaghadereen is a small town in County Roscommon of about 2,000 people, and since March, locals have been working hard to welcome more than 100 Syrian refugees living on the grounds of the defunct Abbeyfield Hotel. Recently, local barbershop owner Sajjad Hussain, who is also involved in the local Islamic Cultural Centre, began by organizing a soccer friendly between arriving Syrian refugees and the existing local Pakistani community. The games are now weekly and the spectators include friends and family of players and local Irish fans. “It’s not easy sitting in the hotel all day. You think more and more about your past and lots of people have had really hard times in Syria. It’s nice to forget for a little while and be involved in sport and have a laugh and a bit of fun,” he told the Irish Examiner. “If something doesn’t touch our hearts when all that happens in Syria, we are not human,” local shop owner Mary said in a November TV3/BBC documentary about the community response. The Syrians are part of an Irish government program pledged to host 4,000 refugees by 2019. Last year, Ireland admitted 760 refugees. After eight years in the making and two years of building and renovations, a new distillery has opened on the historic grounds of the 18th century Slane Castle Estate, 30 miles north of Dublin. Much of the distillery is located in the estate’s Georgian stables, dating to the 1750s, which have been completely retrofitted and are open for tours as well. The Slane Distillery and Visitors Experience represents the latest expansion of Slane Irish Whiskey, conceived in 2009 by Lord Henry Mount Charles and his son, Alex Conynham, whose family own the estate. Previously, Slane Whiskey aged other manufacturers’ whiskeys, but the new distillery will allow the company to produce their own whiskey, reviving a distilling tradition in the Boyne Valley as old as the castle itself. The Irish Passport Service was recognized for its outstanding achievement with the World Class Civil Service award at the Civil Service Excellence and Innovation Awards at Dublin Castle in November. The award was made in respect of the Online Passport Renewal Project, which saw launch of the online passport application system in March. The service means that Irish citizens renewing their passport can do so online anywhere in the world, 24 hours per day, 7 days per week and with no requirement for forms, witnesses, or printed photos. It is one of the first fully online passport renewal services in Europe and since the launch, more than 100,000 citizens have already been issued with passports through the online system. Processing time for an online application is 10 days plus postage time, with no requirement for forms, witnesses, or printed photos. Several outstanding University College Cork graduates were recently honored at the university’s annual alumni awards in November, including the first visually-impaired athlete to complete seven marathons on seven continents in seven days.